McDonald’s early goal put us in control but from nowhere Tagliapietra and MacKinnon turned the game midway through the first half. We recovered after the break, scored immediately with Moult’s header and seemed to have the game won when Skippy got his second. Desperate defending as the clock ran down ended with a Lasley hand ball and Crawford dispatched the penalty. Johnson was in inspired form on the left wing and flew beyond red and white shirts at will. Law collected a high ball at the corner flag, jinked into the box and let loose. McDonald needed only a slight touch to open the scoring. Hamilton were second best and it came as a shock when they equalised. Hall had conceded a foul wide on our right and the 6’4” defender rose to head home. It got worse three minutes later when a speculative effort from MacKinnon, 20 yards out, floated into the postage stamp corner. 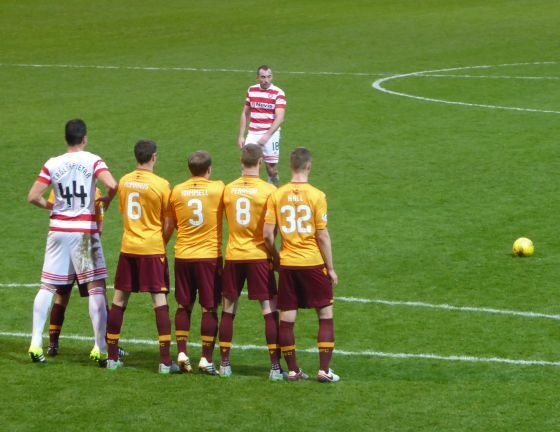 A shaken Motherwell were glad of the break to sort out their problems. With 46 minutes on the clock a good run from Moult allowed him to square the ball along the six yard line where McDonald was covered by two defenders. His first effort was block and he was on his back but he got a foot to the ball and rolled it into the net. With most of the 5,744 fans urging us on we pushed up. Just before the hour Grimshaw made an excellent charge on the right wing and fired a tempting cross to the near post. Moult glanced a header beyond McGovern to level the game. We had the lead for the second time and kept up the pressure. Johnson stung McGovern’s hands with a fierce shot but the fourth goal did not arrive. Five minutes of added time were signalled and the Accies threw all forward. In the dying seconds Lasley handled and received his second yellow card. Crawford sent the away fans home the happier with the low driven penalty. Still, our last five games have seen two draws and three wins, not a bad return.